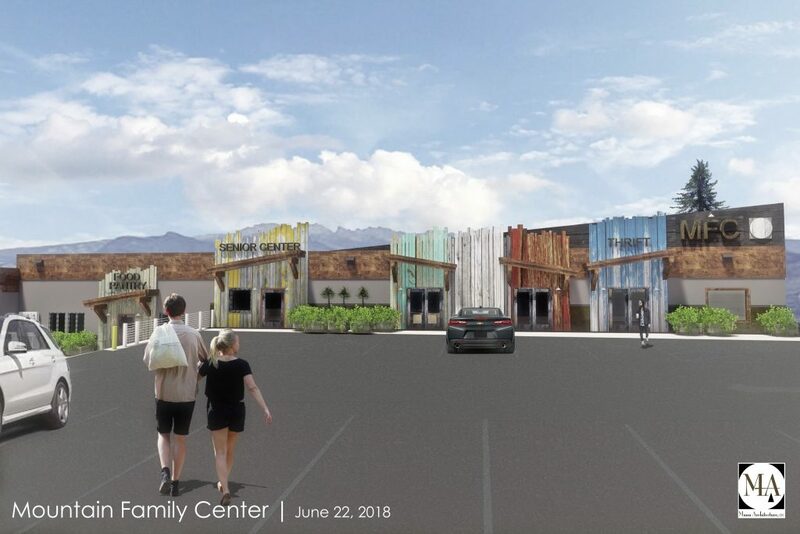 This conceptual drawing shows what the eastern façade of the Mountain Family Center building may look like once renovation work is completed. 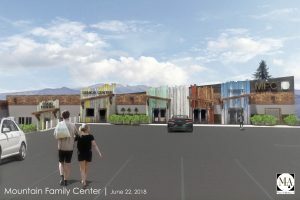 GRANBY — Major changes are in store for the nonprofit Mountain Family Center this summer as the organization looks to tackle a nearly half-a-million dollar renovation and upgrade project at its headquarters facility. 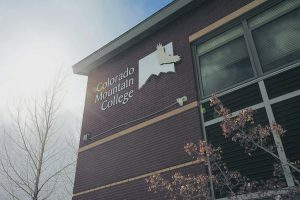 Mountain Family Center last year purchased its current facility, located on the corner of Highway 40 and Railroad Avenue, with plans to expand its footprint within the building as well as the scope of services they provide. Early last year, officials from Mountain Family Center announced the organization had purchased the building located at 480 East Agate Avenue in Granby. Mountain Family Center, including the organization’s administrative offices, food pantry and thrift store, were housed on the building’s southern end for several years prior to the purchase. 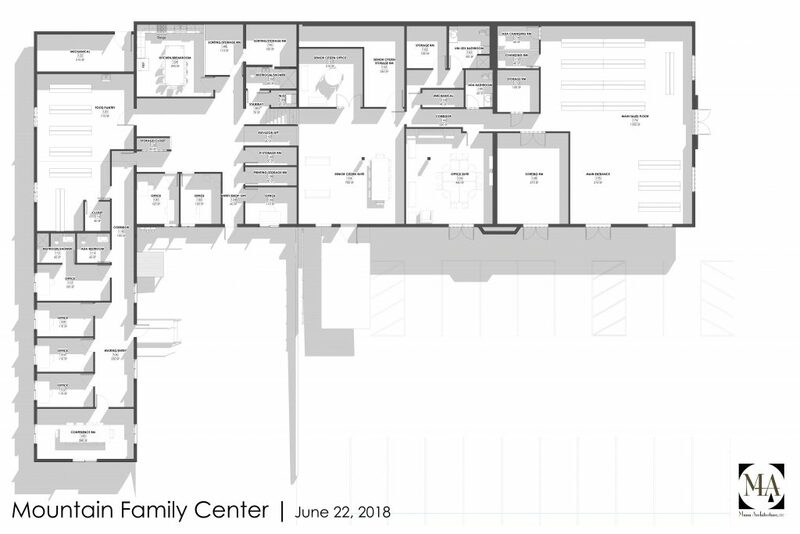 This image shows the floor plan for the future renovated Mountain Family Center. Interior renovation work is already underway on the building as workers remove interior walls and reframe exterior ones in the space that was previously occupied by Mind Springs Health. As part of the renovation work, Mountain Family Center is moving the organization’s thrift store a few 100 feet north. Once work is completed the thrift store will occupy the space previously occupied by Mind Springs Health. 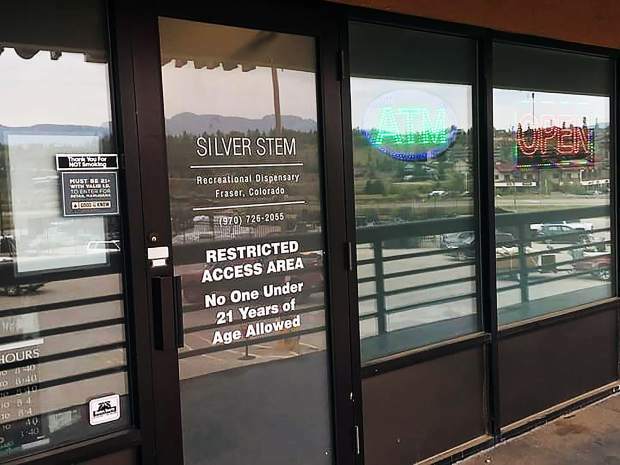 Last summer, Grand County’s Council on Aging merged with Mountain Family Center and was renamed the Grand Seniors. Once renovation work on the building is complete, Grand Seniors will move into the building, as well. 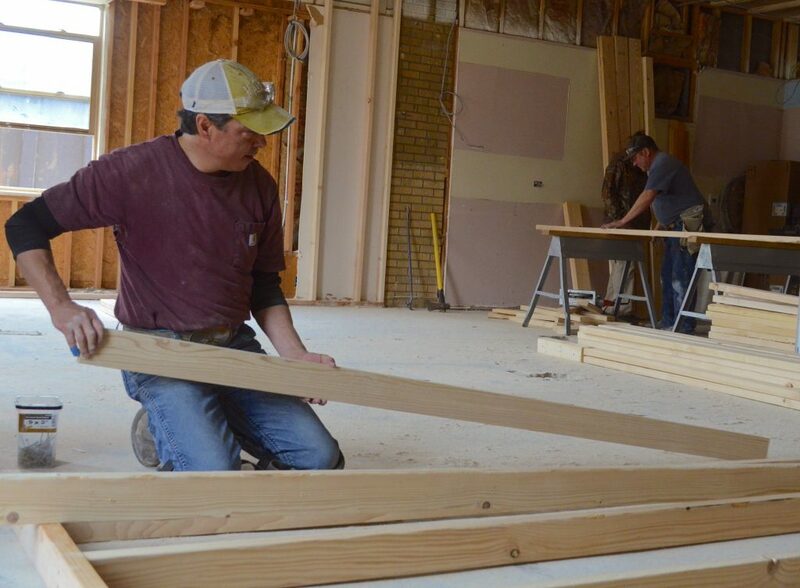 Local framers, Matt Medina (foreground) and Drew Lutz (background) both of Tabernash based Lutz Construction work to construct new walls inside the Mountain Family Center building in Granby. Additional work on the project includes the removal of walls to create more interior floor space in Mountain Family Center’s existing food pantry area and the building’s current waiting room area. The space that previously served as a meeting room in Mind Springs will soon house offices from the early childhood resource organization Grand Beginnings and the building’s existing kitchen area is being upgraded to serve as an educational instructional kitchen where classes can be taught. Officials from Mountain Family Center hope to have the interior renovation work completed by Aug. 1. Exterior renovation work will include new signage and distressed wood design elements along the building’s north and east facing sides. The project also includes landscaping work and the addition of a drainage trench and a small fence near the future entrance for Grand Seniors. Sedlar said exterior renovation work will not likely begin until spring 2020. According to Sedlar the total cost of the project adds up to roughly $460,000. So far, Mountain Family Center has been able to raise $304,000 from local sources. 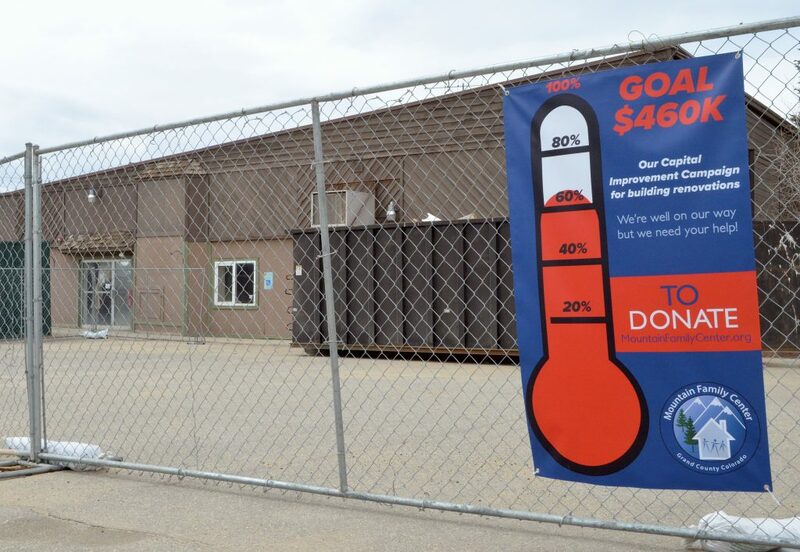 A sign in front of Mountain Family Center in Granby shows the organization’s has raised over 60 percent of its $460,000 fundraising goal for the renovation project. Funding for the project has come from a variety of sources, and includes in-kind donations from contractors working on the project, totaling close to $40,000. 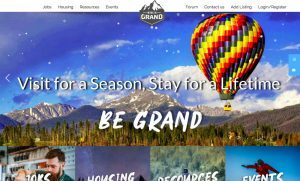 Munn Architecture helped Mountain Family Center with planning and design for the renovation and the local governments for Granby and Grand County waived permitting fees for the project, Sedlar said. 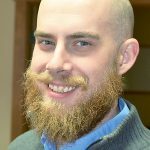 According to Sedlar, Mountain Family Center received $75,000 from Mountain Parks Electric while Grand Foundation provided $50,000 in additional funding, above and beyond it’s normal annual allotments, to cover building renovations and expansions of Mountain Family Center’s program services. Mountain Family Center has been in existence since 1979. Originally called the Fraser Valley Women’s Resource Center, the organization it was renamed Mountain Family Center in 2000 and has moved several times over the past four decades. In 2013, the organization moved into its current location in Granby. 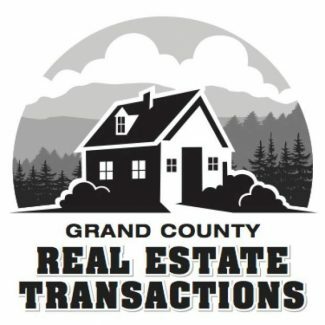 Sedlar said the organization has grown by over 200 percent in the last six years in terms of clients seeking services.